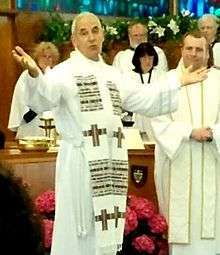 Gary J. Paterson (born 1949) was the Moderator of the United Church of Canada from 2012–2015. He is the first openly gay person to take the post since the church was formed in 1925 and the first in the world to lead a major Christian denomination. He was elected to the position on August 16, 2012, at the 41st General Council of the church after six ballots, and was installed as Moderator two days later. Paterson was born in Whitehorse, Yukon in 1949, and as an "army brat", lived in Toronto, Ontario and Germany before his family settled in Vancouver, British Columbia. He earned two degrees in English literature and became a sessional lecturer at University of British Columbia. He then studied theology in Boston and the Vancouver School of Theology before being ordained by the United Church of Canada in 1977. Paterson served as minister at several rural and urban churches, became a staff member of the British Columbia Conference of the United Church, then served as minister at three churches in Vancouver: Ryerson United Church, First United Church, and his current church, St. Andrew's-Wesley United Church, where he is Lead Minister. He received an honorary doctorate from the Vancouver School of Theology in 2012. In an interview following his election, Paterson acknowledged that the United Church faced many challenges, but while in office, he hoped to bring inspiration and hope during times of change. Paterson currently lives in Vancouver with his spouse, Tim Stevenson, a Vancouver city councillor who, in 1992, was the first openly gay person to be ordained by the United Church. Paterson has three children from a previous marriage. ↑ "United Church Elects New Moderator" (Press release). United Church of Canada. 2012-08-17. Retrieved 2012-08-20. 1 2 3 "United Church of Canada elects first openly gay moderator". Ottawa Citizen. 2012-08-16. Retrieved 2012-08-16. ↑ "St. Andrews Notes & Announcements: Honorary Doctorates". St. Andrews United Church. 2012-08-17. Retrieved 2012-08-17.